New SimonRack utility shelves offer many smart design features that take an ordinary utility shelf to the next level. SimonRacks are easy-to-assemble and require no nuts or bolts. Simply tap the shelves into place with a soft mallot at each corner support. You will be set for storage in about 10 minutes... it's that simple! Shelves are adjustable to different places along the corner posts. You can even flip the shelves upside-down so that they have edges to them, or place them at an slant to display items in a more decorative manner. 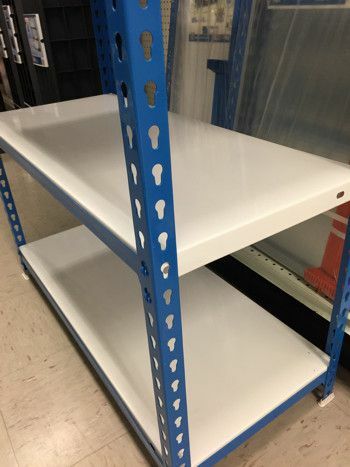 SimonRacks all include heavy duty metal shelves that can hold up to 200 lbs per shelf! Long-lasting design: Each shelf is held into place with strong metal tabs. Rather than plastic collars/inserts that weaken typical utility shelves, the all metal design of SimonRacks make them some of the strongest shelves on the market. Stop by our Hardware department to see our display of the SimonRack super-strong storage shelves (try saying that 10x fast :). We are stocking 5 different sizes/strengths, depending on your needs. Check out the video and see just how easy a SimonRack is to build and just how versatile each one can be. Thanks for reading about what's new!